Creake Abbey Cafe & Food Hall01328 730399work CafeWelcome to Creake Abbey Café & Food Hall. We are open 7 days a week, from 9am, serving great breakfasts, excellent coffee, seriously good lunches and afternoon teas with homemade cakes. Open until 5pm in high season and 4pm in low season (check exact dates below). We offer selected Friday evening dining all year. Visit the website for updates and events including regular quiz, steak and themed nights. Our Food Hall includes a fine butchery, cheese counter laden with speciality cheeses from Norfolk and beyond, and a wide range of deli items including homemade meals to take away, fresh produce, staples, beer and wines from around the world. Our in-house butcher along with our resident cheese guru are on hand to advise and offer tastings. 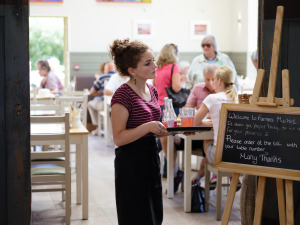 Welcome to Creake Abbey Café & Food Hall. We are open 7 days a week, from 9am, serving great breakfasts, excellent coffee, seriously good lunches and afternoon teas with homemade cakes. Open until 5pm in high season and 4pm in low season (check exact dates below). We offer selected Friday evening dining all year. Visit the website for updates and events including regular quiz, steak and themed nights. Our Food Hall includes a fine butchery, cheese counter laden with speciality cheeses from Norfolk and beyond, and a wide range of deli items including homemade meals to take away, fresh produce, staples, beer and wines from around the world. Our in-house butcher along with our resident cheese guru are on hand to advise and offer tastings.